The election is finally over and here are the day’s headlines. 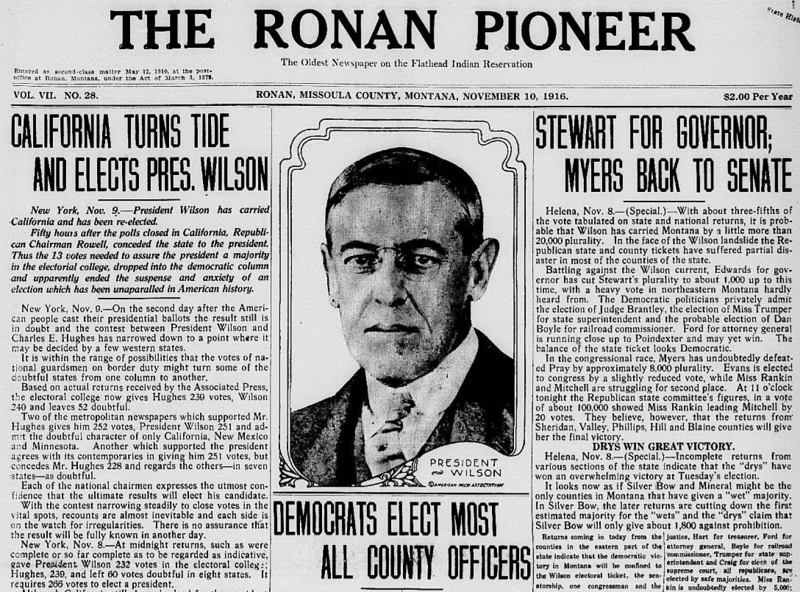 Those were the big stories in the Ronan Pioneer on November 10, 1916. California provided the 13 votes that put Wilson over the top in the Electoral College. The press of the day proclaimed it was “an election which has been unparalleled in American history.” (If they only knew what would happen 100 years later). Thanks to Wilson’s landslide victory in Montana, incumbent Gov. Stan Stewart narrowly defeated his Republican gubernatorial challenger, former Helena Mayor Frank Edwards. Missoula County also went almost entirely Democrat in 1916, with the exception of the state legislative seats. There, four Republicans and only one Democrat were sent to Helena. Perhaps voters then, as now, were tired of all the campaigning, because much of that week’s paper was devoted to non-election happenings, including farm and ranch updates. Experts predicted the year’s wool crop would hit 25 million pounds and be worth nearly $8 million. Others said next year’s grain crop should be the largest ever. There was also auto news. Motor-tourism was becoming huge. Colorado had just issued a report that motorists dropped $12 million in that state last year. With the construction of the park-to-park highway system, Montana was expecting thousands more auto-tourism dollars, too. A Billings auto wholesaler, F. B. Connolly, urged the state to do everything it could to make motorists welcome in Montana. The paper even carried a series by Charles M. Russell. Then, there was the story from Anaconda. 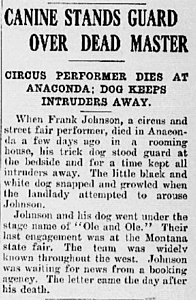 “Ole and Ole,” a circus act, had just finished an engagement at the Montana State Fair. 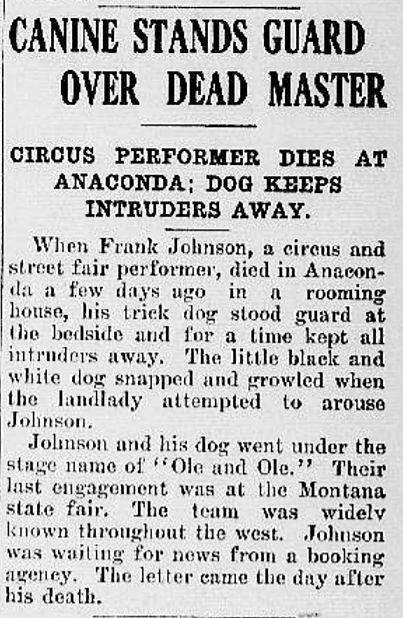 The first “Ole” was Frank Johnson. His partner, the other “Ole,” was a checker-haired dog. F. N. Aldrich wants to buy some chickens. Old or young. Doesn’t matter. That’s the news from Ronan.